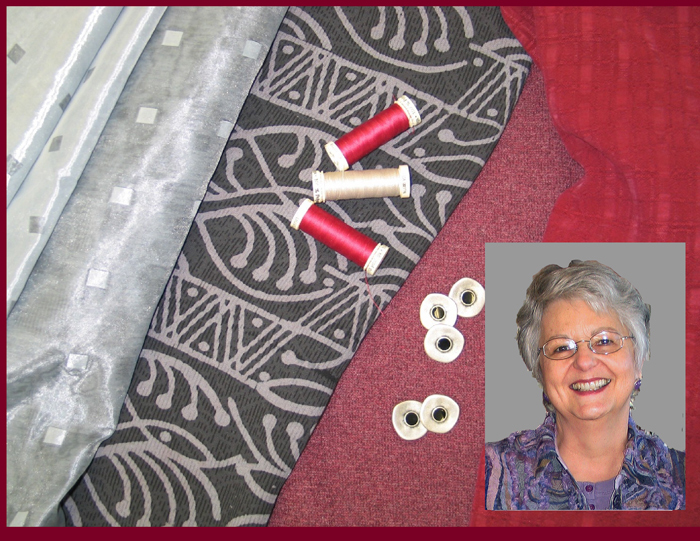 Whether you have been sewing for years or are just dreaming of what you might make if you only knew how, Jane Foster is the sewing teacher you are looking for. She has taught classes in sewing, tailoring, couture, and clothing design to people of all abilities for forty years, spending fifteen of those years as a color and image consultant. She is particularly adept at fitting clothes, and will meet all the sewing challenges you bring to her. In her sewing classes and workshops, you can become skilled at sewing the clothes you want to wear with the fit, color, and style that suit you. You may also discover the fabric artist or couture seamstress hidden within you. “Jane Foster has a remarkable ability to help us find creativity we were not aware we had. And she does it with such grace and humor. " Her beautiful, light-filled sewing studio is peppered with items to stimulate your imagination. If the texture, color, and feel of fabric are calling to you, then come, and be one of Jane’s students. You can join her in the Sewing Classes or Workshops she offers several times a week in her sewing studio. You would also enjoy being part of the group of wonderful women joining her on a Sewing Vacation. Jane's students are so glad they found her. Here are a few Student Comments. While Jane's main passion is sewing, she also loves to paint watercolors. Here is a slideshow of a few of Jane's Watercolors for you to enjoy.